This post brought to you in partnership with Revolution Math. It’s summer! WHOOO! Let’s live it up a little! But that wonderful long (but too short) break from school can attribute to kids forgetting some of the material they learned over the school year. Or maybe summer is the perfect time for you to help your student catch up a little on a subject they are struggling in. I NEED to introduce you to Revolution Math! Sign up for the 14 day FREE trial here! Use promo code TSALARY50 to get 50% OFF your first month! I had never heard of Revolution Math until I was offered the opportunity to work with them. Since I’m always up for learning about new educational companies I figured what could it hurt? OH my goodness – my son and I are both SO happy we decided to take a closer look! We’ve participated in online learning programs before but this is by far our favorite! 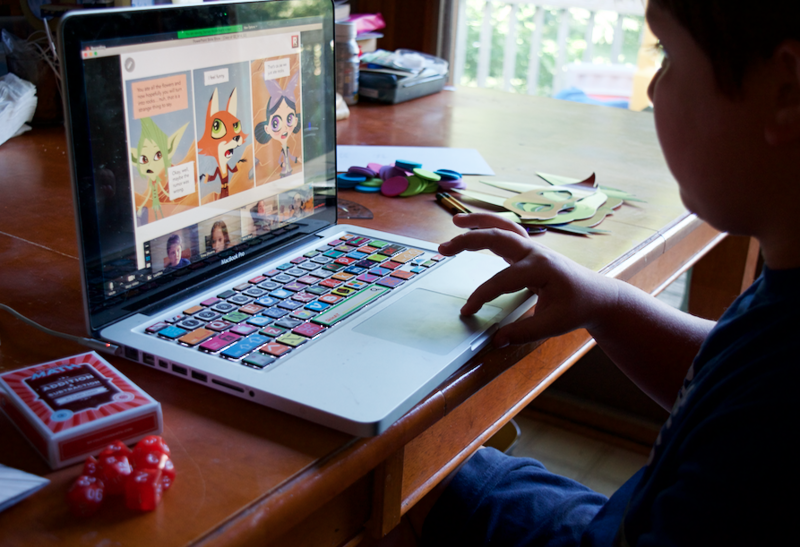 Simply put Revolution Math is an online class for grades 2nd-5th that kids can take. They have an actual teacher video chatting with them each week along with up to 3 other students in their “class”. 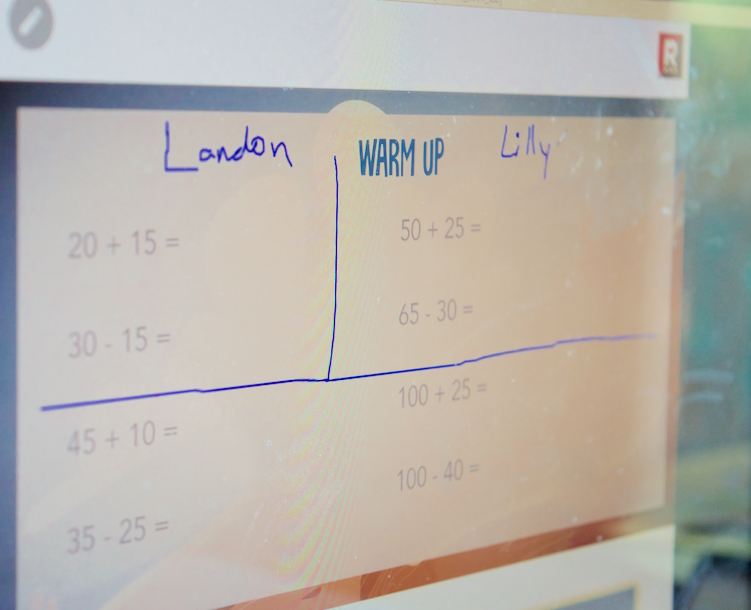 They have the same teacher every week for 60 minutes and parents can track their child’s progress and even attend the classes with their child. We didn’t know what to expect but it is freaking fantastic! My son even had the opportunity to talk with his classmates on the video before the class started. Once my son was signed up for the first class we received a welcome package of supplies that he needed for his classes. It even included the pencils and graph paper! Dice, manipulatives, workbook – it’s all there! Each math class revolves around a comic book style story line so the kids can choose a superhero each week to play. This was a huge interest for my son who has stealth dyslexia. Because of his processing delay he prefers graphic novels and comic books so this was a nice surprise. When I first told my son about taking a math class this month online he kind of gave me “the look”. 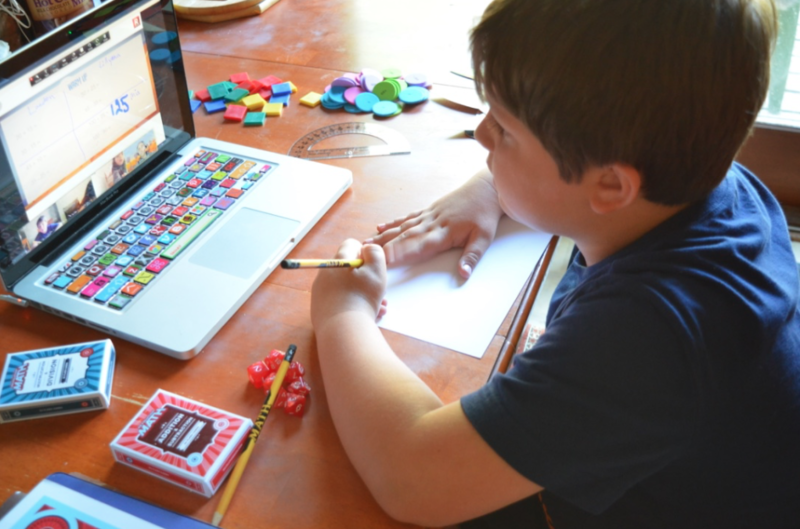 When we received the math package in the mail he was intrigued – and after his first lesson he asked to attend again! Although he doesn’t struggle in academics yet we are starting to notice that this special form of dyslexia is causing a lot of problems with his ability to keep up with his classmates. I think in the future we will absolutely come back to Revolution Math after we’ve settled into our new home and keep him going to stay on top of things. 2. Students work as a team. Throughout the entire class all of the students in the class (there were 3 total in my son’s class including him) take turns and work on problems to complete a page. The teacher divided up the math problems and wrote each child’s name in a section to complete. I love that the students take turns together, work on problems together, can talk to each other through the videos (similar to a hangout) and can learn from each other. Everyone was very patient in waiting for each other to complete their work. The students can then work the problems out on the screen or on paper in front of them and type or draw the answer on the screen. There is a format toolbar that allows the kids to edit colors, writing utensils, etc. It was a pretty even balance of the teacher talking and quiet work time. Our teacher was phenomenal at being patient while waiting for the students to finish their work and he always acknowledged and encourage them as they chatted through class. But he always stayed on task so there was no wasted time. 3. The class is story based and game based! This is (partly) why the Revolution Math class is so fun! Not only was the teacher for my son’s class pretty good with the kids but the entire class is built around a comic book story. Every child can choose which superhero they are going to be and when that character pops up on the screen the kids have to read their part. My son loved it! He chose Rowan the fox. I felt like there was plenty of time for all of the children and different reading levels to read their parts of the story and no one was rushed. The math class is also Common Core aligned and game based where each child takes a turn rolling dice or completing tasks to participate in the game. One of the games my son played with his classmates also gave him points to earn awards which was a fun incentive. 4. Students can earn awesome prizes! The students can earn gems over time which they can then exchange for some pretty incredible prizes! We all know kids love an incentive and this one is pretty over the top! I’ve seen a lot of prize “stores” in educational programing but Revolution Math tops them all! I’m not sure how long it takes to collect gems but it certainly seems like a pretty awesome incentive plan. 5. Sign up for FREE for 14 days! Let’s talk money! Sign up for the 14 day FREE trial here! You can’t go wrong – it’s like 2 FREE math classes!! PLUS use promo code TSALARY50 to get 50% OFF your first month! (that’s HUGE!) Classes for the entire month run at $149 – if you break it down that’s only about $37 per class (based on a 4 week month). If you’ve ever used (or looked into) any educational programming like this you’ll see that not only is this competitively priced but the structure of the program is much more personable with a better incentive base. 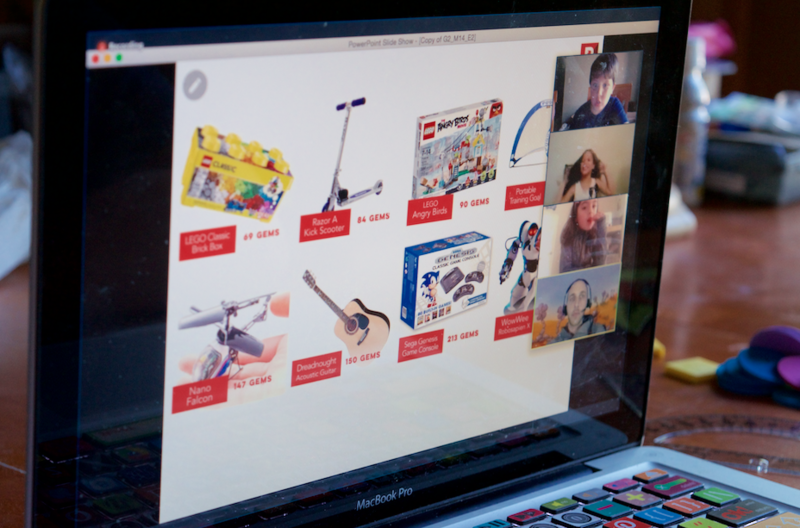 It made a big difference for my son to have personal contact with his teacher to interact via video. I definitely recommend at least signing up for the 14 day trial – you’ll have the opportunity to see whether it is something that will work for you in 2 weeks. Revolution Math was built around four pillars of research indicating how students learn more effectively: Story-based learning, digital game-based learning, small class size, and positive teacher-student relationship. Learn more on the Why It Works page. This sounds like a great way to get kids excited about math. It’s such an important and difficult subject for so many kids. I love it. I really wish there were things like this when my kids were small. Heck for that matter when I was little! Math was such a hard subject for myself and my daughter! What a great class!! I love that it has a common area. I think it is very important for home schooled children! It gives them the best of both worlds. Revolution Math looks awesome. 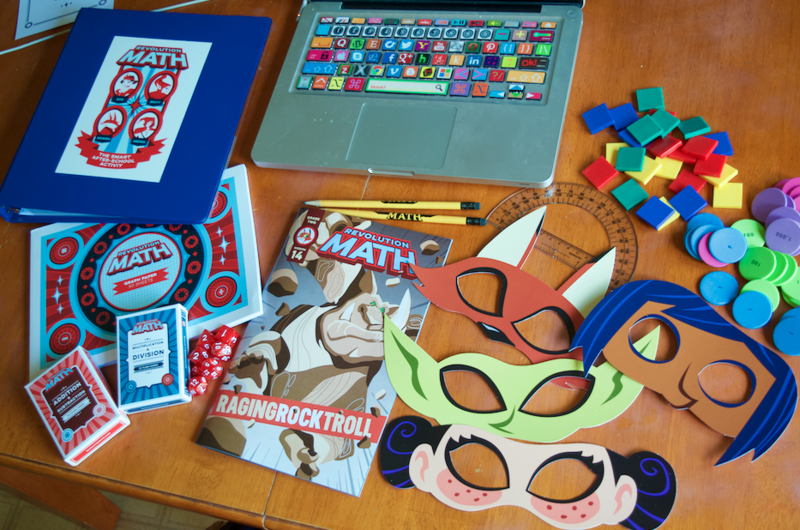 What a great way to get children excited about a subject many dread…math. I’m all for making math fun in any way possible. This looks like something my son needs. I home school and we struggle in math. I think if he were to have a different way to learn, with another teacher, where it is fun, he would totally do it. That math looks a lot more fun than any math I ever did! This would be great for kids to help them avoid the summer slide or to even get ahead a bit! I really need things to help my son with math. Wait no. I really need things to help ME help my son with math. You see he’s great at math and I can honestly say that it really isn’t my subject. I am going to have to try this free trial so my son has resources to use over the summer. I think that’s pretty awesome. It’s not just for the kids that are having trouble with keeping up in class, it’s for anyone who would like to learn more about math in a fun and easier to understand manner. It’s convenient because it’s online as well. Love it. It looks like an amazing program! My son happens to love math. I may have to try the trial of this with him. I love that this is common core aligned and that students can work together. As a former teacher, sounds like a perfect supplemental program! I am going to try the trial! Sounds like a very useful program to improve math skills. I like the sound of this website! Going to try it soon for my nephew, he loves maths! Wow this Revolution Math Online class looks amazing. I bet this would be a great resource for homeschooled kids. 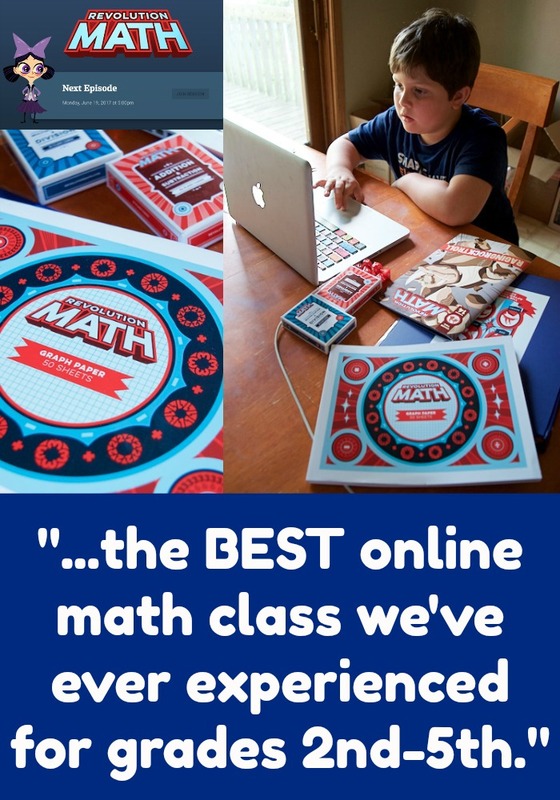 It really looks an amazing program and looks perfect for my son to study math even if he’s in our house.